Bloating is a common problem during the holidays. The holidays are almost over, and that means we'll all finally get a break from the series of delectable feasts that typically mark the end of the year. Before we can say "till next year," however, we have to get through New Year's Eve. If you're worried about bloating from all the food, there are some steps you can take. But first, a note: If bloating is a constant problem for you — one that goes beyond the holiday overeating — then seeing a doctor is the best way to determine what’s causing it and how to treat and prevent it in the future. Bloating refers to the feelings of fullness, heaviness and pressure you might feel after eating. It can cause discomfort and pain, and is sometimes accompanied by visible distention in the abdomen, making your belly look swollen and larger than usual. Bloating is a symptom; not a medical condition in and of itself. Sometimes it’s only a temporary issue — like when you’ve eaten too much in one sitting — while other times it can be a sign of a chronic underlying health condition, such as irritable bowel syndrome or Crohn’s disease or fluid accumulation in the abdomen caused by cancer, liver disease or heart failure. Most often, bloating is caused by your diet — specifically excess amounts of food or drinks, or the gases that are produced when the digestive system processes these ingredients. Issues like constipation or irregularities in the way muscles move in the digestive system can contribute to bloating, too. (STOCK/Getty Images) A woman holds her stomach in an undated stock photo. What are the best ways to prevent or treat bloating? Resolving issues with bloating might involve a range of strategies, including changing the food you eat and your eating patterns. Some people might need behavioral therapies to help make these lifestyle changes. Others might need medications or supplements to put them on the right track. Dietary changes can help a person experience less bloating in part because they can reduce the amount of gas produced in the digestive system. For example, research has shown that a low-fermentable carbohydrate diet, also known as a “low-FODMAP diet,” helps to reduce gas and bloating because it eliminates many gas-producing foods, including wheat, onions, garlic, milk, yogurt, honey, apples and cauliflower. If you feel bloated after eating these foods, then try cutting out FODMAP foods and slowly add them back into your diet, one at a time, to see if you can pinpoint which ones are causing the bloating. You can also try eating smaller meals more often and minimizing your intake of carbonated drinks and salt. If you feel constipated and bloated, try adding more high-fiber foods into your diet, drinking water, and exercising — these will help to improve bowel movements, which can reduce those feelings of fullness and pressure. 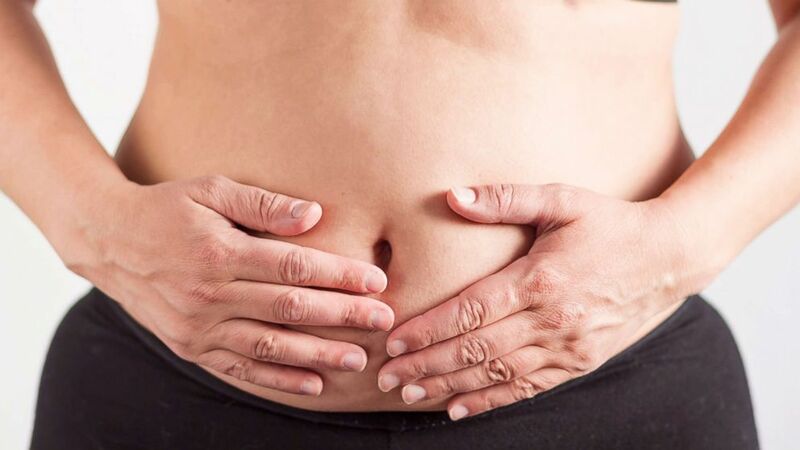 Bloating may be a sign of something serious if it causes more severe problems, such as abdominal pain, recurrent vomiting, diarrhea, bloody stool, fever, unintentional weight loss, loss of appetite or chest discomfort. If you experience any of these, see a doctor as soon as possible. You’ll want to make sure that you don’t have a more serious health condition.